Story: World-premiering at the 2010 Venice International Film Festival. 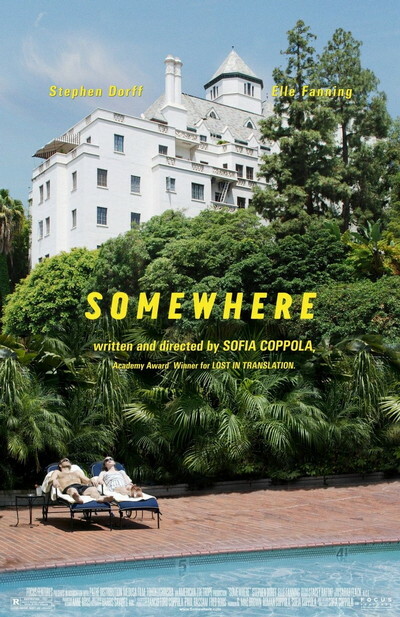 From Academy Award-winning writer/director Sofia Coppola (Lost in Translation, The Virgin Suicides, Marie Antoinette), Somewhere is a witty, moving, and empathetic look into the orbit of actor Johnny Marco (played by Stephen Dorff). You have probably seen him in the tabloids; Johnny is living at the legendary Chateau Marmont hotel in Hollywood. He has a Ferrari to drive around in, and a constant stream of girls and pills to stay in with. Comfortably numbed, Johnny drifts along. Then, his 11-year-old daughter Cleo (Elle Fanning) from his failed marriage arrives unexpectedly at the Chateau. Their encounters encourage Johnny to face up to where he is in life and confront the question that we all must: which path in life will you take?